Imagine, if you will, a world where your mailbox is constantly flooded with college brochures, each threatening to take that sweet little child you once held away on a 4 year journey- only to return them as an adult. A world where you remember only yesterday securing your little creature in a car seat- and now you find yourself strapping on for dear life as they take the wheel. It is a dimension where your pockets will be empty and your worries elevated to pinnacles you doubt your sanity can barely stretch to accommodate. You once knew everything- and now know nothing. No longer cool or wise, you are barely tolerated and each eye roll reminds you of that cruel fact. The signpost up ahead laughs at your plight and tells you- that once that 13th candle was blown out- you have now crossed over into the TEEN PARENT ZONE! Want to know the secret to survival? You gotta laugh! 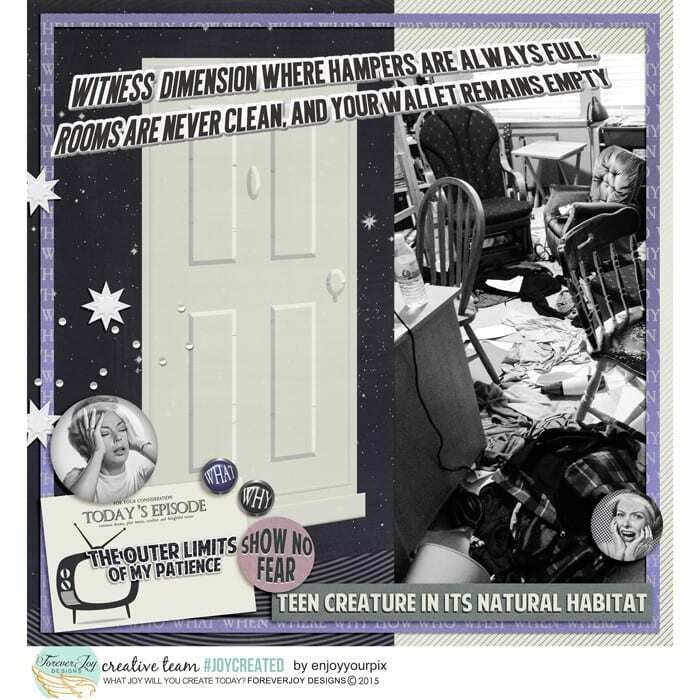 This collection was designed as a sort of scrap therapy for parents of teens! What better way to get relief from teen angst than scrapping the drama in a lighthearted way? And as a bonus- all those teen photo that have looks of disgust, eye rolls, mouths open in protest or blur from running from the camera- will work perfectly with the theme! How’s that for revenge!? As an added bonus- and sign of solidarity- the Journal Cards FREE with your purchase of the design this weekend!